Product prices and availability are accurate as of 2019-04-17 19:18:21 EDT and are subject to change. Any price and availability information displayed on http://www.amazon.com/ at the time of purchase will apply to the purchase of this product. The Eva Roman tub faucet and hand shower in oil rubbed bronze (view larger). Offering an elegant, transitional design that gives today's home timeless appeal, Moen's Eva bathroom collection features tapered, sophisticated lines to deliver a look that will never go out of style. 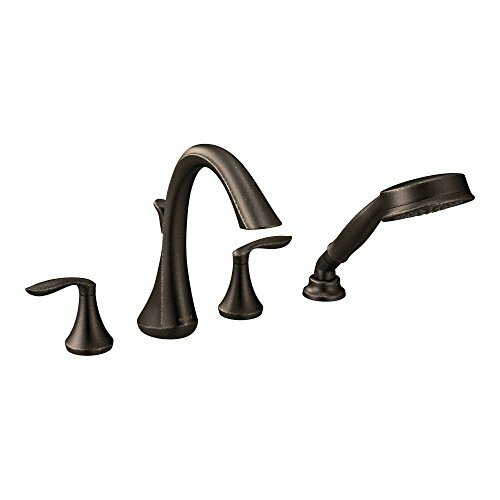 This Eva two-handle high arc roman tub faucet comes with a four-function hand shower. 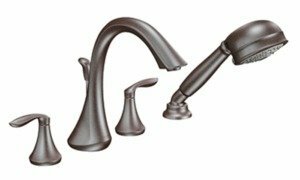 Pair it with other items from Moen's Eva range, including faucets, shower kits, towel bars, and other accessories. This version comes in an oil rubbed bronze finish that delivers a rich, dark brown, old world finish with striking light and dark accents, and it's also available in chrome and brushed nickel. The levers have hot and cold temperature indicators, and they rotate to increase flow (counterclockwise for hot and clockwise for cold). The single-function hand shower has a maximum flow of 2.5 gallons per minute (gpm). This set is ADA compliant. 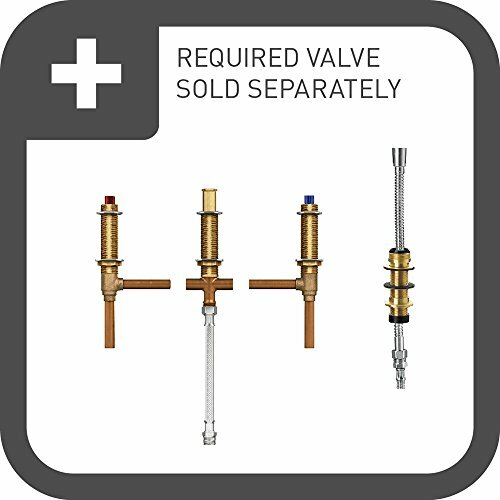 Note that this set does not include a valve; it is compatible with Moen valve models 9792, 9793, 9796, and 9797. 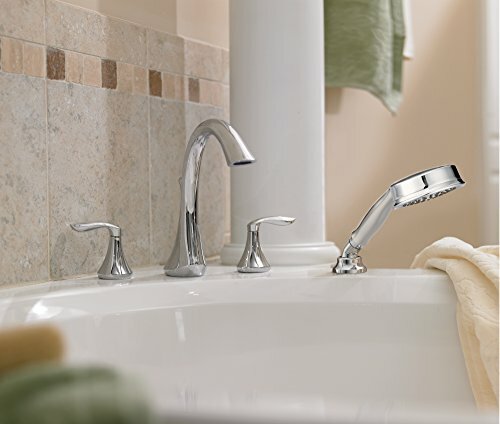 With Moen, changing your bath and shower faucet style is as easy as changing a light bulb. 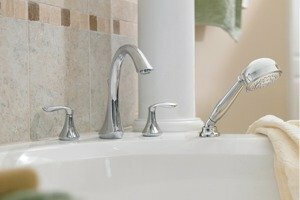 Install any of Moen's M-Pact-compatible faucets once, and you can upgrade the style at any point in the decorating or construction process--or switch style years down the road--without replacing any faucet plumbing. All changes can be made above the deck or in front of the wall.